I started this post way back last summer, time to get it out there. I spent some days in June 2011 in Essaouira, Morocco. Alone. (I had to as I had to leave the place where I’d been working but my flight wasn’t until three days later) I am a, let’s say, young, not that unattractive girl – but even if I wasn’t, pretty sure I’d have made the same experiences. When I walked through the medina (city), on both sides little shops and people advertising their products, guys shouted after me, or came closer and started chatting, asking for my name etc. I felt very uncomfortable – it may be a culture where people just talk to people, which is rarely the case in Western societies, but when you’re a girl surrounded by strangers it might not be the best idea to go for it. I may be naive, but not that naive, and in that situation it’s probably best not to risk it. So I just tried to ignore them, walked past them quickly, out of the medina to the beach, and then I just kept on walking until there were hardly any people so I could have a swim, tan and read in peace. On my way back, a guy suddenly joined me. He asked whether it was okay if he walked with me, I didn’t mind, he seemed alright and I should maybe be less paranoid, in the end he was just a person too. We had a good conversation actually. He told me he was from Casablanca, had a wife and kids there. He overwhelmed me with compliments. I enjoyed making up a story about myself, and when he wanted my fb or email address I said he should give me his email address instead. He asked whether I would write before I left so we could meet again, I just smiled. And he emphasised how much prettier Casablanca was and if I came to go there sometime I should definitely get in touch with him. mhm. Next day, same procedure. On my way to the beach I was followed by a guy for at least five minutes, which was a little scary. Luckily I managed to outpace him. This time on my way home two guys on horses chatted me up, offered me a free ride with them. I said no though it was very tempting seeing that they charged everyone else haha (but I wonder what they would’ve wanted in return instead…). As I continued walking back to the medina another guy joined me. Apparently, he was from Casablanca, too. He was camping with friends next to the sea. He seemed quite straightforward, asking me to join them at their camp to smoke something, drink tea… I declined with thanks. In conclusion, don’t go to Morocco alone if you’re a girl, and maybe also not in a group of girls – have a guy with you. Unless you want to be chatted up by someone every other minute. Which is nevertheless quite flattering ;). And might even finance your stay if they ended up paying for your meals and if you stayed at their places – an option, not for me though. Some guys can be rather cheeky, maybe don’t believe everything they tell you – even if they seem honest it’s hard to figure out whether they’re telling the truth (for example both ‘Casablancians’ said Casablanca was much nicer and less touristy while I was told differently by friends…)… I know it’s wrong to judge by stereotypes and so on, but in some cases they do apply and then it’s better to play safe. 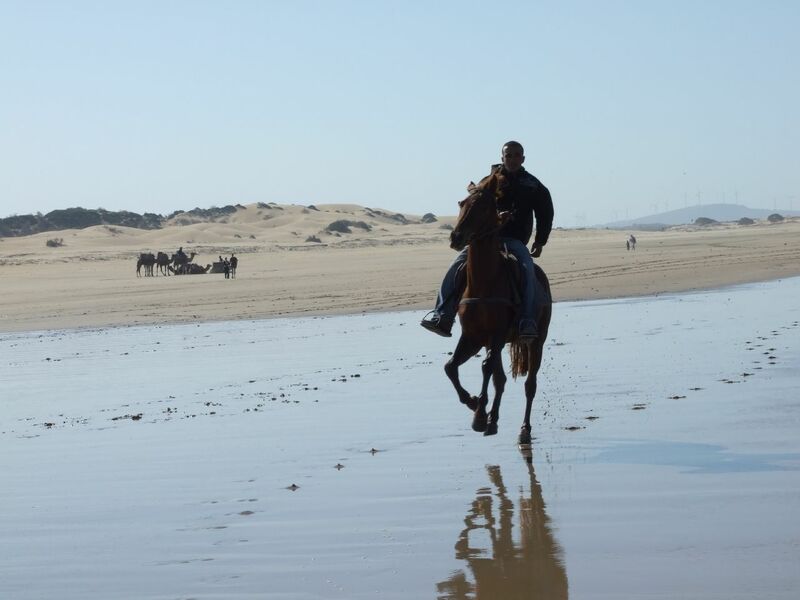 This entry was posted on 27/04/2012 by G in Cultures, Places and tagged Casablanca, casanova, caution, Essaouira, men, Morocco, naivity.